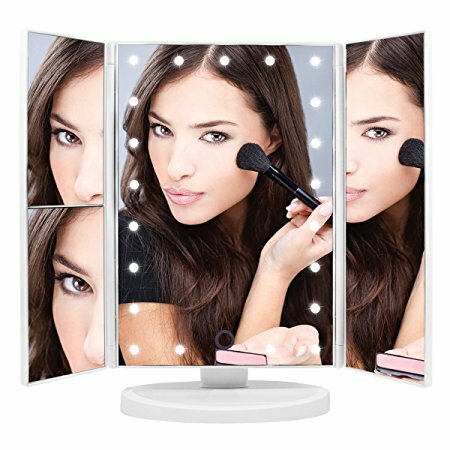 A useful lighted makeup mirror mimics natural light and lets you keep cool while applying your makeup. Maybe you have had that experience where you’ve applied your makeup and thought ‘Damn, I should be in a magazine somewhere…’ Only to leave the house, and catch the reflection of some hot mess you’ve never met before! If you are applying makeup for daytime, the best light is the one that you’ll probably be exposed to the whole day. Day light! If you can’t use daylight, the next best option is the closest copycat. The most important property for an efficient makeup mirror is the bulb. This is because of the type of light it emits. Then you should consider the size, magnification, and placement or portability. Let’s start with the color of the light you need. White light comes closest to emulating natural light. So when you buy the mirror, stay away from warm, yellow light bulbs. They make you look good no matter what you’ve done to yourself. That’s why candlelight is so romantic. It’s way too forgiving and just makes everything look lovable…! So whether you’re lighting up your dimly lit vanity or using a smaller, surface or wall mounted mirror, opt for white light bulbs. Then you are going to choose between three different kinds of bulbs. These are LED, flourescent, and incandescent bulbs. Only two of these have while light options. These are LED, and flourescent. Here are the pro’s and con’s of all three. You can also look through the costs and fact chart for a full comparison. This in terms of running costs and lighting. LED bulbs save energy, and money in the long run. So say you have a 3 mirrors where everything is the same except for the bulbs. You’ll pay twice or 3 times the amount to initially buy an LED Mirror, than you would for the other two types of lights for a comparable mirror.. It will give you about 40 times the hours you’d get from an incandescent bulb, and cost you roughly 10 times less in electricity per year. It will give you roughly 6 times the hours you’d get from a flourescent bulb, and cost you roughly 3 times less in electricity per year. These are your usual office lights. In a mirror, the light works well at being bright and white. They’re cheaper to produce, so that’s probably why most manufacturers use them in their mirrors. That though, sometimes doesn’t make them any cheaper. When you compare the quality of lighting, fluorescent might give you stronger light. So fluorescent light is second choice to LED if the price is right for a comparable mirror. They’ll give you marginally(not too much)less hours than an LED and cost a little more to run.